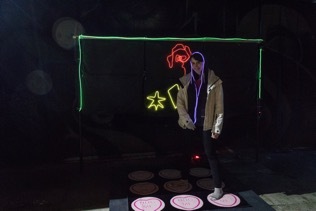 Group Hug's illustrator, Xanthe Bodington, standing on the hug mat in front of the light display. An interactive light installation commissioned as part of Spectra Aberdeen's Festival of Light. A collection of ͚hug pads that people stand on to hug each other. The more hug pads with people standing on at once the more elements of the light artwork is turned on. A fuller write up of the project will be appearing here soon. Novalia - for the production of the Hug Mat and their print touch technology. Rollstud - for the nuts and bolts that held the base together. Curated Place - for onsite setup and giving us the opportunity to take part.